What kind of preparation or study should take place before exams? No review or special preparation is needed. For children in grades 1-3, all of the answers are oral, and for children in grades 4-6, you might require some written answers (if the child is doing written narrations), but much of it will still be done orally. The goal of a CM-style exam is to allow the child to tell what he knows--not point out what he doesn't. For example, if you've been reading about Columbus, you could simply ask, "Tell me what you know about Christopher Columbus." You might get a long lovely narration that omits "1492" and the exact names of the ships, but you will know that your child knows the basic history surrounding Columbus. You might get a cryptic answer such as "He sailed across the ocean with the Nina, Pinta, and Santa Maria and discovered America instead of India." In this case, you can tell that your child recalls pertinent details about the story, but for whatever reason didn't want to tell the whole story. Neither one of these answers is wrong. The length of a narration is not always the relevant point. You will proceed like this, asking just one or two questions, probably, from each book that you have been reading. You will ask your child to recite anything you've memorized (poetry, Scripture). You will require a neat sample of handwriting (copywork). You will ask your child to sing a song you've learned, describe one of the paintings from picture study, tell which piece of music was his favorite and why, and so on. The exam should touch on each area of your curriculum--even math. Picking two or three problems from your child's math program and asking him to solve them is enough. Or, you could ask him to teach you how to subtract, or whatever, and let him explain the process. Many parents like to tape the answers to exam questions and type them up later. (I find it very hard to type while listening to a child narrate rapidly, and I hate to slow them down.) If you have to keep records for the state, or a make a portfolio, this is a great thing to include. Evaluating the exam is not always easy. You will learn a lot about you and your child. The first time I gave my oldest child an exam like this (he was 8 at the time), he narrated at great length and remembered many details of stories--but was able to give very few specific names of people or places. Thus, I got very elaborate stories about "a man who met someone in a town." I was able to correct this by asking him to be sure to use the correct names for things in his daily narrations, instead of being too general. I now never let him begin a narration with "He..." He always have to give me the name. You might notice other things--such as that a particular book isn't really making an impression. I think it's normal for children to narrate at great length about some things, and then give shorter answers to other questions. One thing that CM did was to count the number of substantives (nouns) that the child used in the exam. This gives you an idea of the number of "things" the child is able to discuss knowledgeably. Some of her sample lists are 100-200 items long, including words like "trees" as well as "King Henry V" or "Canada." The first exam should be evaluated very generously, as it will be a new experience for you and your child. It will be your baseline for observing his progress from term to term. If I felt that the exams were stressful to my children, I would probably not do them. This was supposed to be an enjoyable finale to the term, not a dreaded experience. "Tell me what you know about weather" is probably not as good a question as, "How do the clouds help me to know what kind of weather we might be having? Describe the different types of clouds." Or: "Pretend you are a weather forecaster and tell me what kind of weather we will be having on a winter day (or for an older child..."in March")." Writing good exam questions is tricky, and it's great when we can share questions that work (or don't work!) very well. I probably still haven't answered all your questions about exams, but I hope this gives you a feel for what they were. 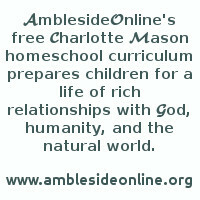 The AmblesideOnline curriculum is intended to resemble the curriculum offered by the original PUS schools as closely as possible. They had exams, so we include them in our schedule. If you choose not to do exams in your homeschool, that's fine! It's probably worth trying at least once, as a learning experience, and then you will know if it is something you want to continue. I have found that exams make a nice break in our schedule, and Charlotte Mason believed they were important because children knew they would be expected to narrate material not only "today," but later, for an exam, and thus their attention was better engaged. It's worth a try! I'm in the midst of exams with my 9 yos - something I had skipped earlier this year (I have done them in the past in Year 1 with him, but this is my first time with exams while he was in Year 2....in fact, this was Year 2, Term 3...we'll start Year 3 next week). The thought I wanted to share was that I recorded his answers - and I was pretty discouraged while he gave them today. He was moving constantly as usual, sometimes objecting to a newly asked question, often distracted and distracting, just really all-over-the-place. But tonight I played the tape for my dh. When I heard this still kid-sounding voice of this little boy I so love, and I was able to just listen - without constantly moving him toward the microphone (I needn't have worried, it picked up everything) or stopping him from doing yet another near back-flip - I felt it was 50 % better than I had thought this morning. So if you have a student who is doing exams orally (my ds does not write any narrations at this point, he is still mastering beginning reading), I'd suggest you record it - and then later, when they're asleep :-) fix yourself a cup of something soothing, settle in, and listen....and you may "hear" those exams in a clearer fashion! Charlotte Mason did give exams every term. She thought they were a very important part of her program. The younger children answered their questions orally and the teachers transcribed them. There are sample exam questions in volume 3 of Miss Mason's books. I think that she believed these were valuable for the students, for the same reason the initial narrations are given. To give them an opportunity to review the information in their own minds, to process, reflect, and most importantly, to communicate what they know. When they know that they will have to narrate something, in some way, after every reading, they attend to the reading with sharper attention. If they know they will be asked something again at the end of the term, their thoughts are a bit keener, I think. As Wendi said, exams were always a part of the original PNEU work. I typed in a sample exam a few weeks ago--you might want to search the archives to look at it. CM exams were NOT of the "fill in the blank" variety. They were not designed to show up all the things the children didn't know. Instead, they allowed the child to tell what they did know in answer to fairly open-ended questions like: "What can you tell me about Joseph and his brothers?" or "Tell about Christian and Giant Despair." The purpose of this kind of testing is two-fold. First, knowing that they will be required to narrate and know in the future increases attention beyond the moment. You probably have to work through a few exams before this idea begins to sink in. The second purpose of the test is for the teacher. What books are not working? In what areas have we failed to meet our goals? I always learn things from the exam that are not evident in day-to-day work. Even Charlotte Mason admitted that sometimes they chose a poor book, and the exam results always showed it. I (highly) recommend the last several chapters of volume six of the original series. Charlotte Mason discusses there the scope and methods of her philosophy, and you can see how the exams fit into the whole thing. Which is not to say that, like Wendi, we always DO things just like CM! I didn't give any exams last year at all, and I'm thinking of condensing the one due in a few weeks to just 2-3 days instead of 5. I can assure you, these type of exams are extremely challenging, and provide a much more accurate picture of her achievement and understanding than any other kind of test. The closest way of describing it to something we all have known is by saying it's an essay test. But it's more than that. She is then asked other essay/exam questions, such as: "Describe in detail the order of events leading to the American Revolution," "Explain how you would defend Christianity against such-and-such a differing religious viewpoint," "Tell - as though you were a journalist - the events of the recent presidential election." Remember, there is no studying for these exams, and the student cannot look in any of the books or material for the information. I have often asked her to write a poetic narration, either of "the life of George Washington," or a poetic narration of a poet ("Write an exact sonnet describing the poetry of William Wordsworth," "Write a poem in the style of Percy Bysshe Shelley, reflecting his worldview"). This is also the time she must submit work she has done all along (I don't check work each day) - whether in a nature notebook, her history written narrations, or her Bible chapter-summary titles. This is somewhat grueling, and provides her (and me) with a very clear confidence that she knows this material, and has made connections with it. I can think of no better exam method! If I remember correctly, Miss Mason didn't care much for grades, either, though she did believe that some corrections in both written and oral narrations were also educational. We are not just exchanging ideas, we are giving the children knowledge that they don't have, according to CM, so corrections and additions will sometimes need to be made. In a composition or written narration, I think her idea was that it was better to work on one or two points at a time. So, for example, if my child is prone to sentence fragments, passive sentences, and improper capitalization, I would choose one of those and point that out in her work, and work on improving that area. When we succeeded with that, we'd move on. In her exams she had a unique approach. She counted all the proper nouns (or was it nouns? I think proper nouns--I also think Karen would know better than I). Anyway, she counted up all of whichever it was in each child's paper as an indication of how many relations they had formed that term. Here's an excerpt from Miss O'Ferrall's article on the Work and Aims of the PNEU, a Parents Review article posted on the AmblesideOnline site. "This method of narration and reports is one of the secrets of the P.U.S. Think of the time you save. You read your book once and you know it and go on to another and there is no looking up at the end of term before the examinations, indeed this is not allowed. We will now pass to a week before the end of term. One morning an envelope marked "House of Education, Ambleside," arrives. It contains the examination questions. As soon as the day you have fixed on comes round, you open the envelope and the examinations begin. They last for one week, and the subjects are not all done in one lump--three hours arithmetic, two, history, or whatever it is, but in the usual time set for that subject on the time-table. Thus you might have forty-five minutes history on Wednesday and forty on Friday. You are given one question at a time and when that is finished you are given the next. This method avoids the fatigue caused particularly in the case of younger children when the whole of the time allowed for one subject is taken at once. The examinations are not to be a burden to the children, but a pleasure. If one subject is finished before its allotted time is up then the remainder of the time may be used for another subject which the children have not had time to finish, but any questions for which there has not been time during the week may be omitted. Examinations conducted on this method cause no strain to the children. In the case of little children who cannot write, they dictate their answers, which are written down for them. Songs and repetitions are heard, and exercise books, paintings, handwork and drill are inspected by the father or outside friend, sewing by the mother, and a report of these with marks given by the parent is then sent up to Ambleside [England] with the written examination papers. After a few weeks, this report and papers are returned together with a report from Ambleside on the written work, and from this report you are able to judge where your child stands in comparison to others of its own age. Each subject is marked, 100 being the maximum, and there are remarks by the examiner and by Miss Mason who sees the papers and signs the report of every child in the P.U.S. which amounts to some thousands." See also the AO Exam Project (we're working on creating exams based on AO books).